but all with the same idea: to make beautiful spaces that are simple, elegant, and enduring. Below are select examples from projects I’ve done, that serve as precedents to Landstylist. 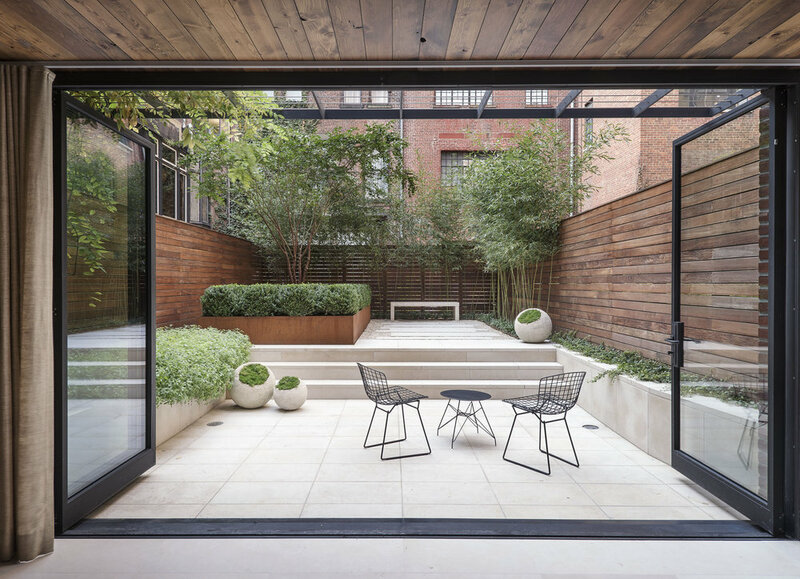 The Townhouse Garden composition was envisioned as a one that is very much in keeping with the architecture in terms of both style and materiality. Simple, clean lines, and Japanese-inspired, with a palette that is for all seasons and yet low-maintenance. The limestone flooring in the dining room continues out into the landscape and becomes a low terrace that dissipates into strips embedded in a bed of pea gravel with steel edging. An off-center, oversized Cor-ten steel planter contains a bed of boxwood, which remains green all year-round, and a white-flowering crepe myrtle is also contained as a focal point. 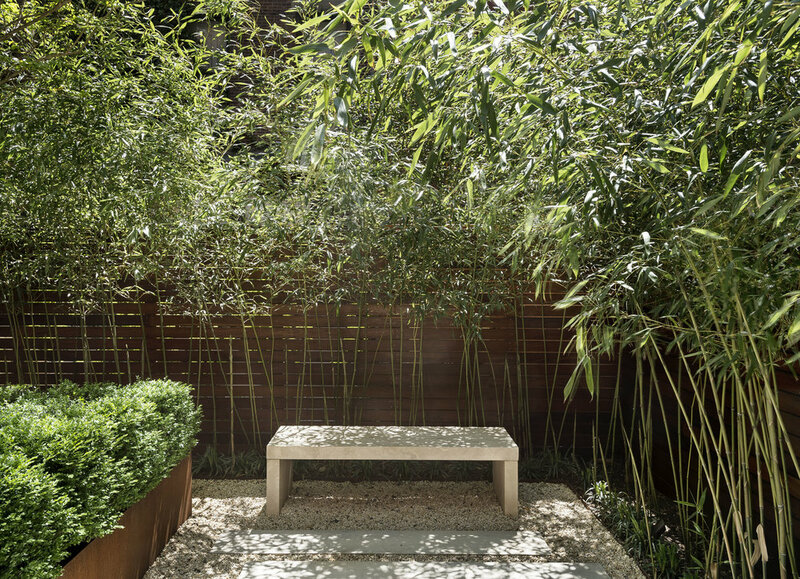 Beds of Nepeta, Ivy and Bamboo soften the horizontal Ipe fencing, and also offer a bit of privacy. Small carved stone planters with moss and a limestone bench offer gentle accents in this garden, which is as much about enjoying outside as it is about the view from inside. 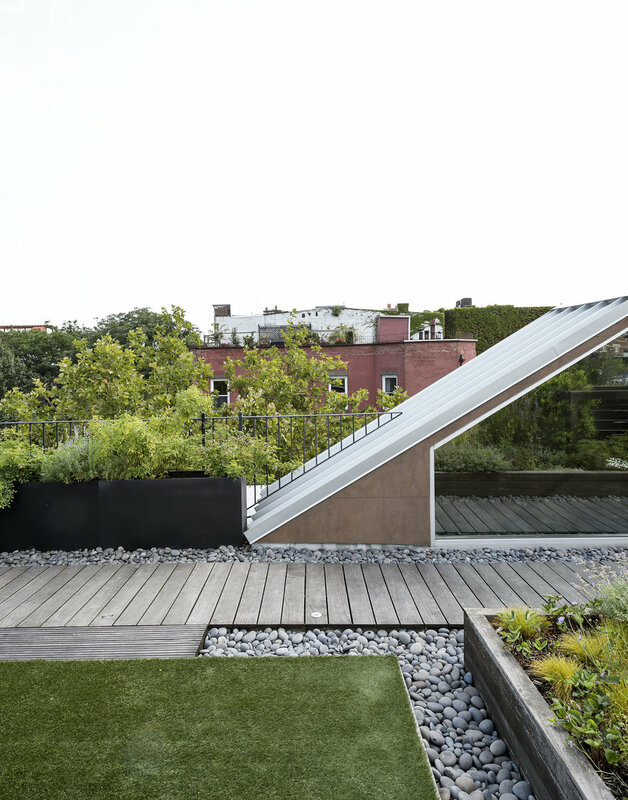 This is a 1,200 square foot urban rooftop garden located in Cobble Hill, Brooklyn. It is a simple plan that has a wood walkway that links two areas on either side of a central skylight, one a deck with seating and dining, and the other a synthetic lawn for lounge chairs. 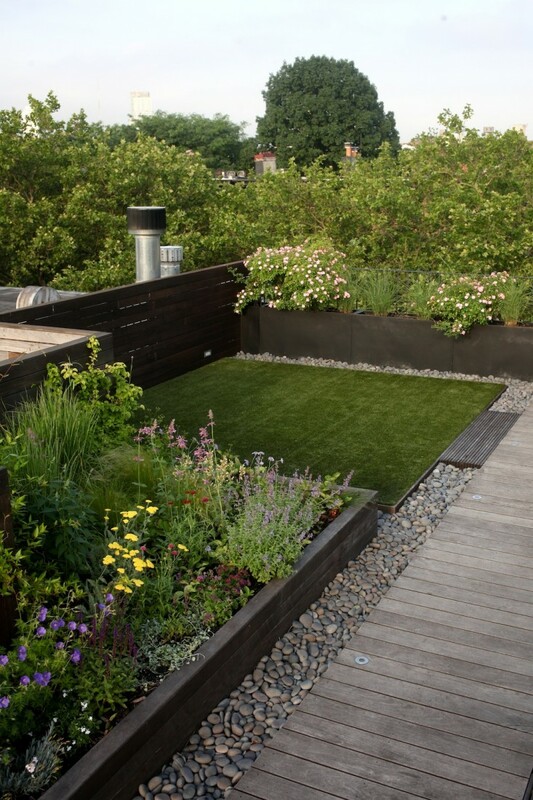 These two open seating areas are separated by a central planting area that is essentially a greenroof, with a mix of wild perennials and grasses. 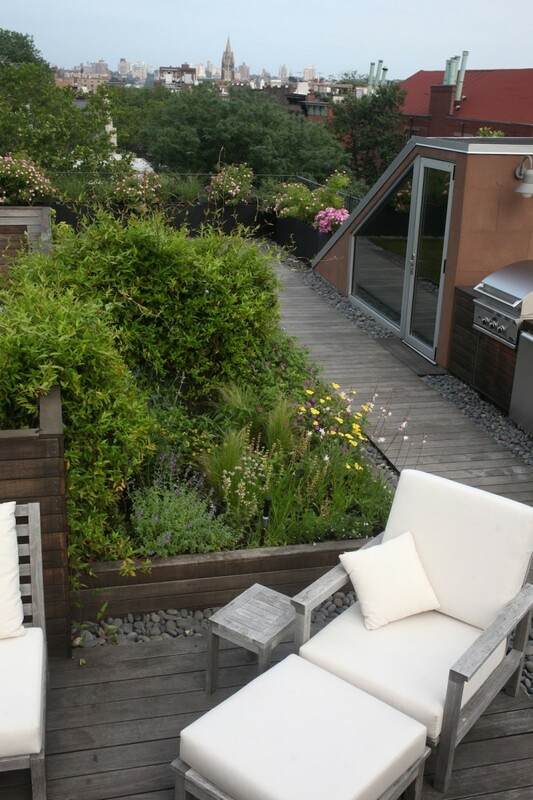 The perimeter is defined by fiberglass planters with a mix of lavender, roses and grasses. Working with architects Khanna-Schultz and installation by Summerhill Nursery, this 5,000 sq. 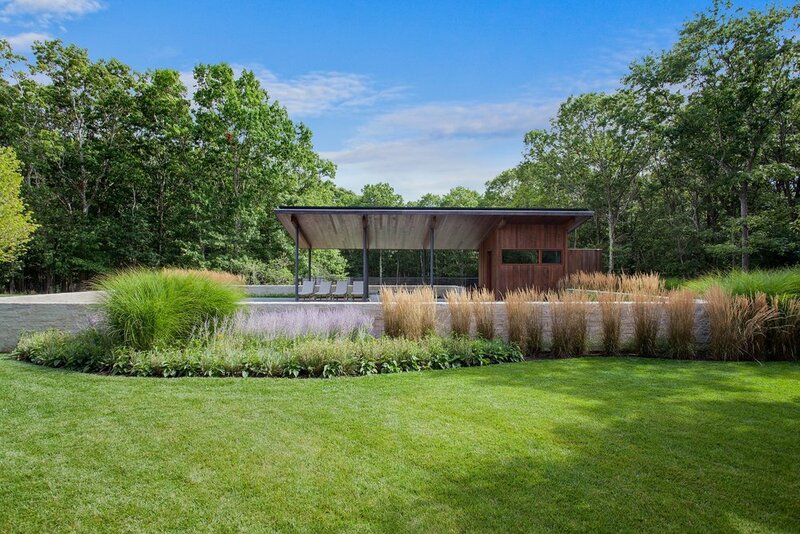 foot weekend house in Watermill, NY was completed in September 2012. The overall geometry of the architecture segments the larger site into smaller spaces that are each further defined by the character of the landscape and the plantings. The house is arranged around a courtyard which is defined by a a large man- made mound created by the excavation on site, serving to anchor the house to the site and creating a sculptural visual centerpiece. The mound is covered with a carpet of evergreen perennials and a grove of crepe myrtles. 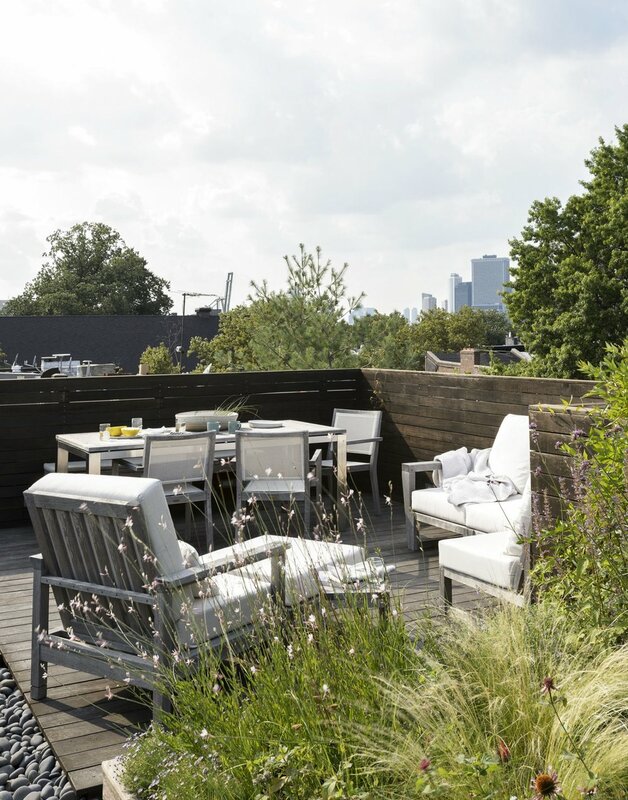 Using plantings that are native to the area, such as birches, maples and ornamental grasses and perennial flowers, the landscape was developed in tandem with the architecture in order to create a relaxing weekend retreat for its owner. The Women’s Opportunity Center was completed in 2013. 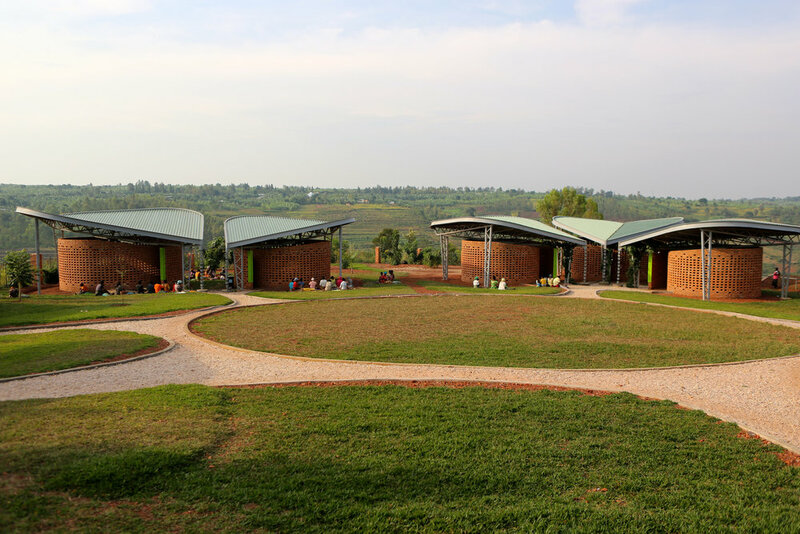 It is a 2 acre site that was converted into a destination for women across the hills of Rwanda. It has classrooms, a Visitor’s Center, a kitchen, a Marketplace, a large gathering space, and a garden called the peace zone. 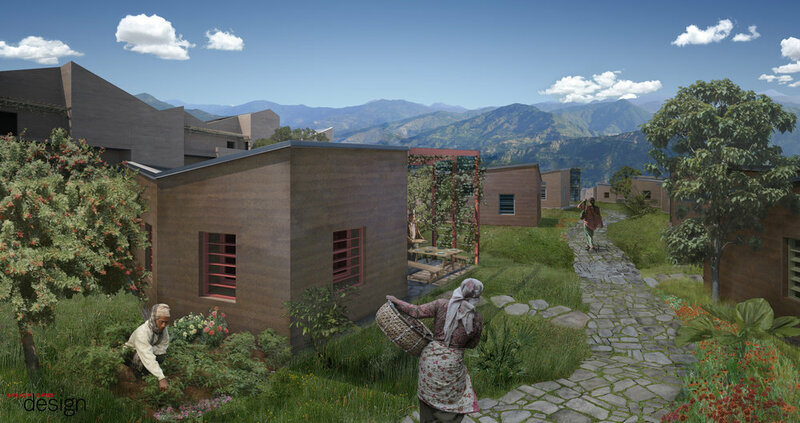 The project is sponsored by Women for Women International, and the architecture by Sharon Davis Design Studio. The landscape consists of several zones going from the most public area to the quietest and more private. The plantings, inspired by the works of Roberto Burle Marx, are drifts of flowering groundcovers, shrubs and native grasses. 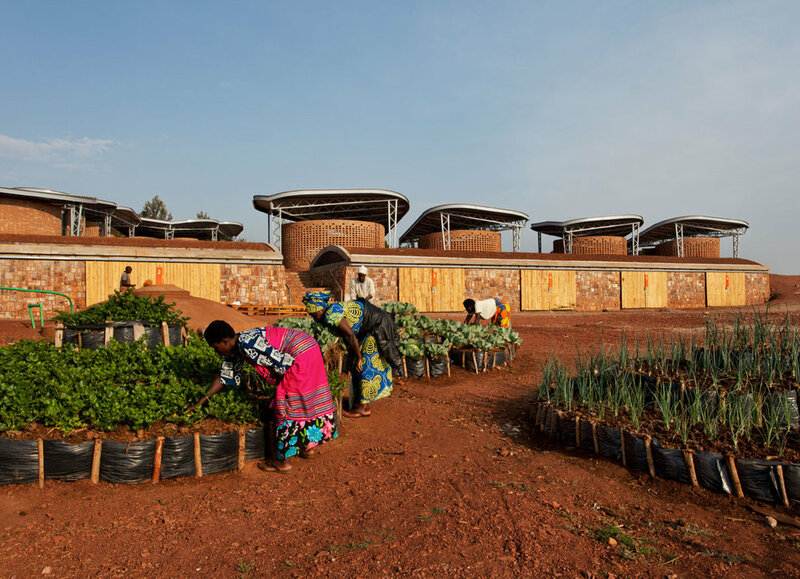 Integral to the project was the ability for plants to be harvested for various purposes lending to the sustainability of the site and economy, such as the Moringa Tree, medicinal and kitchen herbs, bamboo, and fruit trees. The landscape is largely planted from seed, and is in process of evolving and establishing itself on site. I worked in collaboration with Susan Quillian - Maurer, also a landscape designer, who was living in Rwanda at the time and able to oversee the installation. This project was recently awarded the civic and community built projects category at the World Architecture Festival in Singapore 2013. 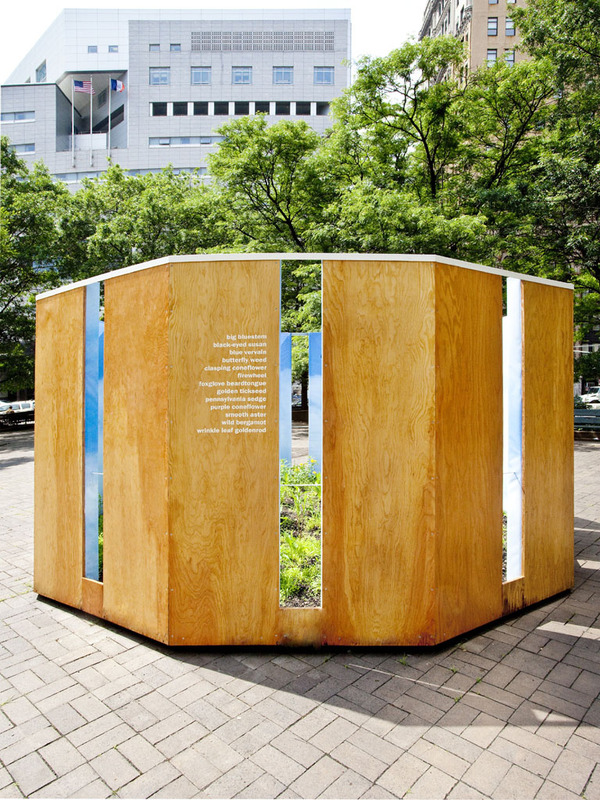 A temporary landscape designed by Julie Farris and collaborating artist Sarah Wayland-Smith entitled, A Clearing in the Streets, was an installation commissioned by the Public Art Fund. A ten-sided plywood structure located in Collect Pond Park housed a meadow, fifteen feet in diameter, offset by a panoramic interior mesh mural of a vast blue sky. Eight-inch gaps spaced throughout the structure permit controlled visual access to the enclosed landscape, exaggerating the disjunction between the natural ecology growing inside and the architecturally defined exterior. 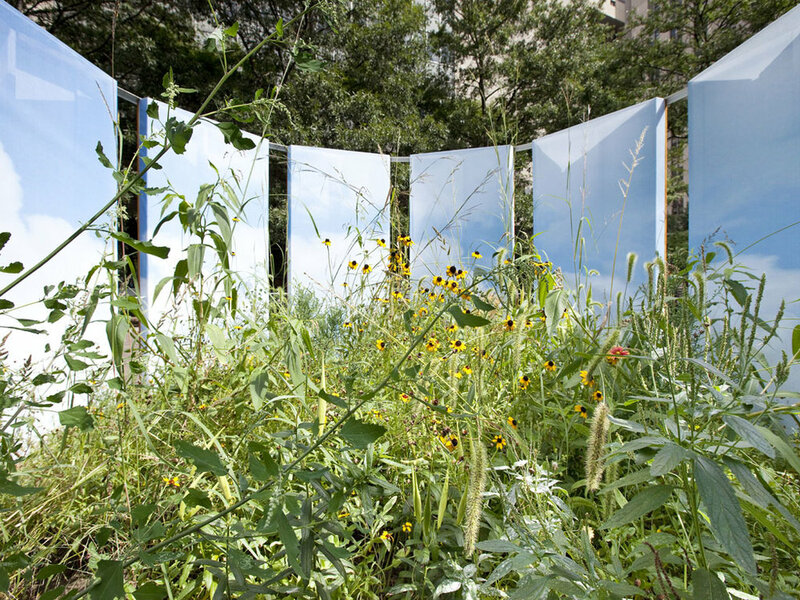 The structure and limited viewing opportunities magnifying the natural cyclical processes of the ecology that, over a four-month period, evolved from seeds and seedlings to a lush meadow of flowering native plants and grasses. The built environment of New York City has almost completely effaced the opportunities for natural systems to exist. Collect Pond Park was once a 60-foot-deep freshwater pond; misused and polluted in the 19th century, the pond had to be drained. A Clearing in the Streets allowed nature to reclaim a small part of the current public plaza, carving out a space to reinsert native plantings. The meadow was in a constant state of transformation, parallel to the flux and endless change of the City itself, to be witnessed by residents in their daily lives. This literal ‘work in progress’ invited the public to return to the installation and witness its evolution. 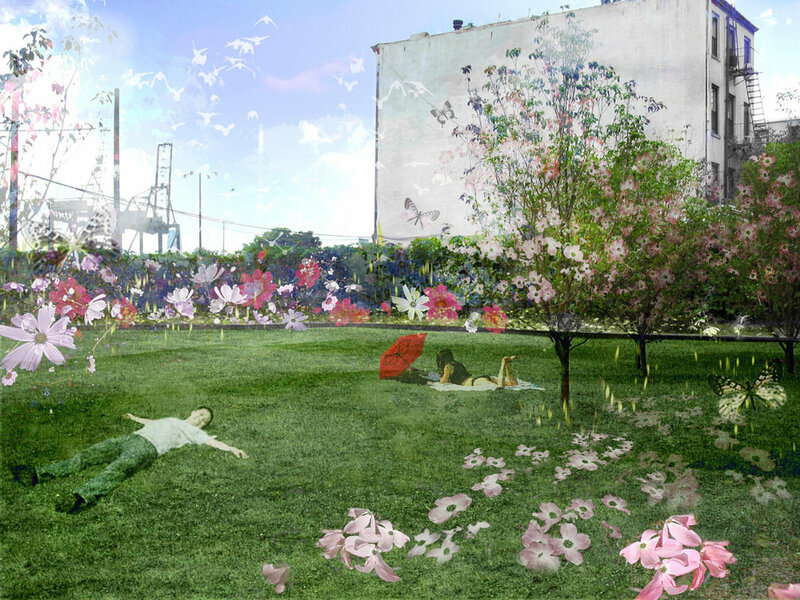 Temporary Landscape: A Pasture for an Urban Space, was a temporary, transportable, and recyclable landscape on a privately-owned vacant lot in downtown Brooklyn, NY. By transforming a vacant lot into a pastoral landscape, Temporary Landscape sought to evoke a sense of rural open space with projections of large moving images of cows grazing, and wide-open meadows and farmland, with rolling hills and all enclosed by a split rail fence on a busy urban corner site.